When this picture was taken, my GPS indicated it was 0.005 minutes of latitude from the North Pole, a distance of less than ten metres. 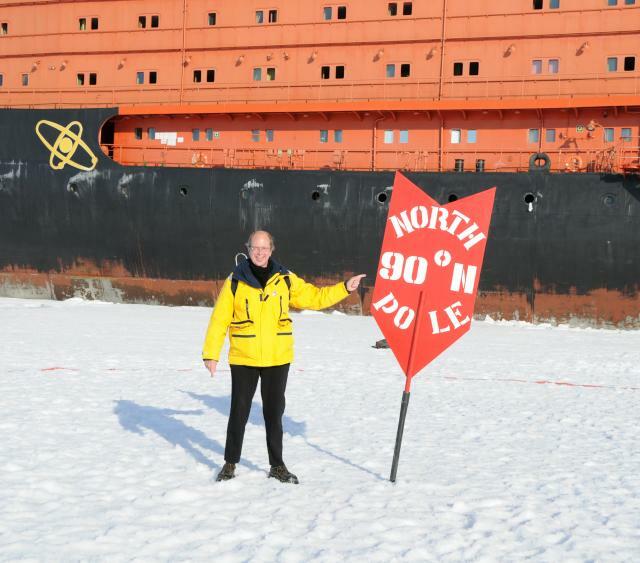 Since the ship is 159 metres long and 30 metres wide, the geometrical North Pole was, at this moment, located under the ship. (A few moments earlier, I saw a reading of 89°59.996' on the GPS, but the photo of that screen didn't come out as well, so I used this one.) 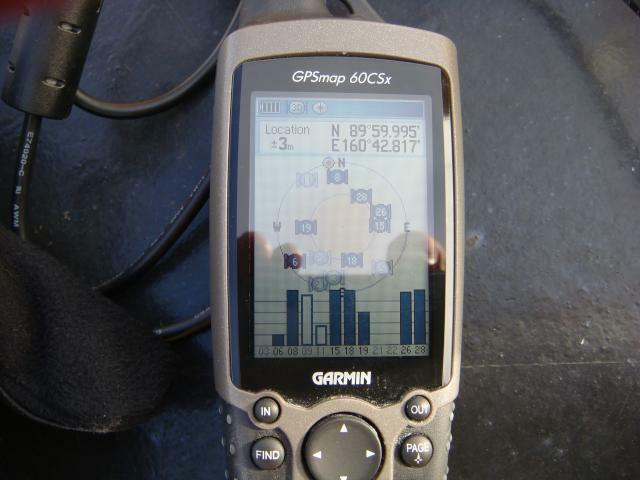 The ship's main GPS antenna is located on the mast amidships, and hence as the captain converged the GPS readout on the bridge to 90° north, my GPS, in the bow where I was taking pictures, moved slightly away from the pole. 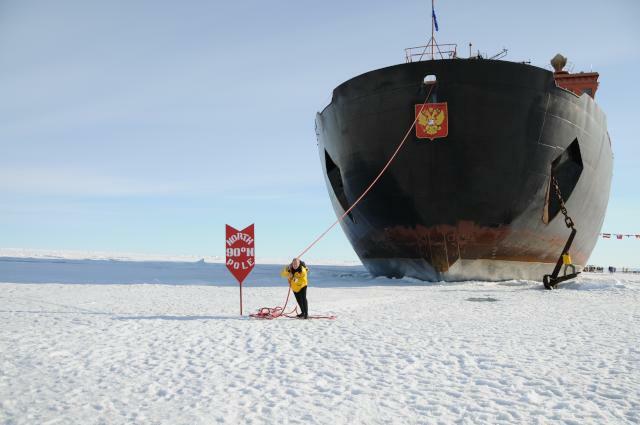 Our expedition became the 71st surface ship to reach the Pole. 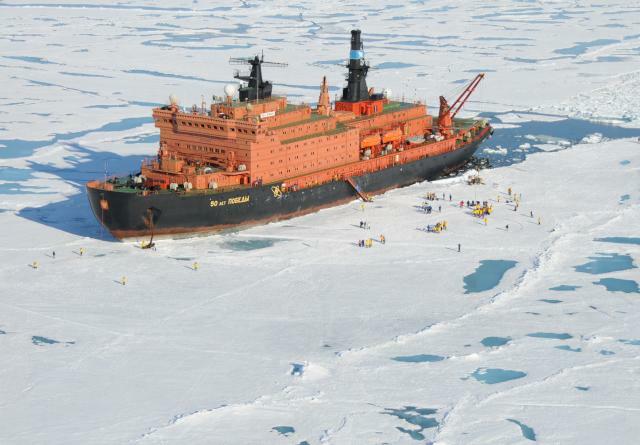 The first was the sister ship Arktika , which arrived at the North Pole on August 17th, 1977. It is estimated that a total of about 20,000 people have visited the North Pole as of 2008, the vast majority on expeditions such as ours. 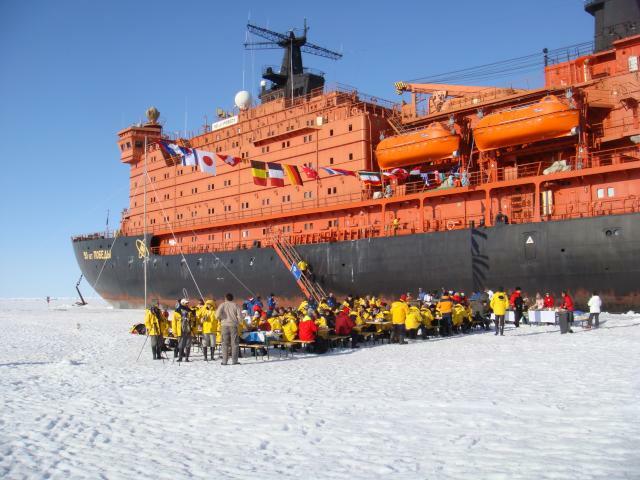 This was the third polar voyage for our ship, all in 2008. 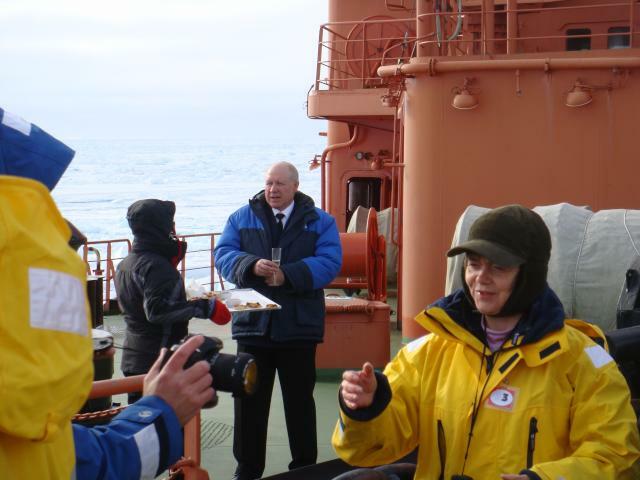 Captain Valentin Davydyants (centre, in the blue jacket) offers a toast to our arrival at the North Pole. Those last 100 metres are a bear! Barbecue on the ice. Flags of the nationalities of all passengers fly from the ship. 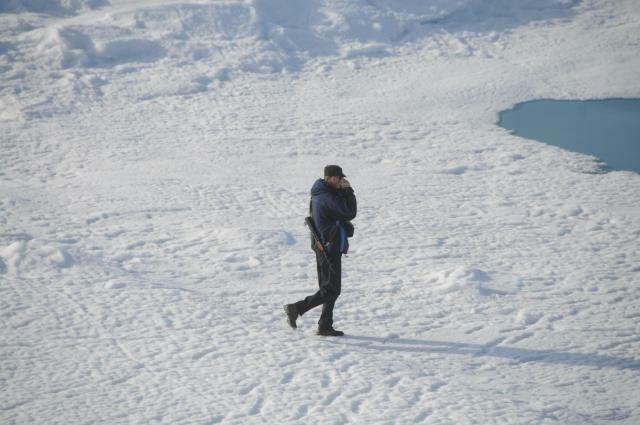 Before passengers descend onto the ice or land on islands in Franz Josef Land, three armed security guards deploy in a triangular pattern to establish a polar bear watch. Firing into the air generally suffices to frighten off an inconvenient tooth, but live ammunition is carried just in case. We never encountered a polar bear on any of the landings during the expedition. 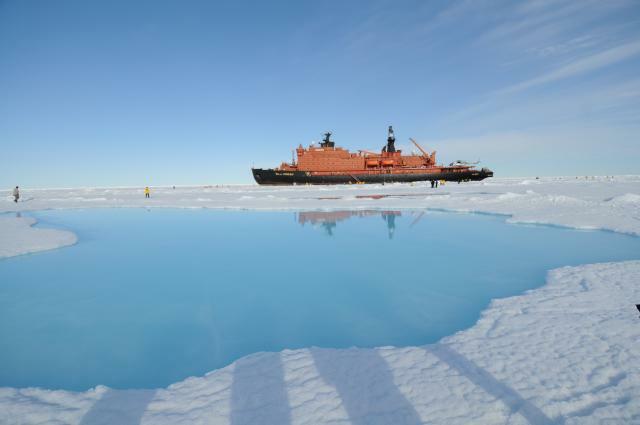 There were a number of shallow melt ponds in the ice around the ship. These are common in the arctic summer. The water in the ponds is fresh. There is between one and two metres of ice between the bottom of the pond and the sea. 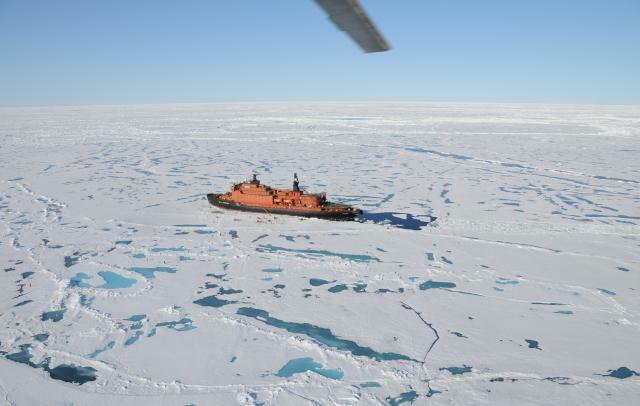 Here is the ship at rest in the ice, as seen from the helicopter. The ship and surrounding ice is shown in this wide angle view. Note the crunched and now refrozen ice along the path the ship took to the Pole. Looking at the icescape along the horizon brings home how alien the polar environment is. This panorama, assembled from 55 telephoto images, captures the impression of scanning the horizon around the Pole with binoculars.